Lilyhammer played on the idea of a US gangster being forced to leave the States to end up in the most unlikely place imaginable, Norway, and it was also a nod to Steven Van Zandt’s role as Silvio Dante in The Sopranos. The problem with Lilyhammer, a problem which is inherent in all comedy shows which run longer than a single season, is that the only way to drive shows forward is with character development and story arcs. This third season of Lilyhammer sees Johnny Henrikson (Van Zandt) getting a rival for his territory in Lilyhammer and the scarely incompetent Jan (Fridtjov Saheim) continuing to make a mess of things. Van Zandt is a decent actor but when faced with a fairly flimsy character, the makers of the show place him in more and more outlandish situations. We get another cameo from foul-mouthed Duncan Hammer (Paul Kaye) and a return visit from Van Zandt’s Sopranos co-star Tony Sirico as his priest brother Antonino Tagliano. Van Zandt’s real-life musical collaborator Bruce Springsteen even makes a small appearance in the final episode as Johnny’s assassin brother. The eight episodes here are still a lot of fun and Van Zandt’s supporting cast are very strong especially his right hand man Torgeir Lien (Trond Fausa) and Saheim. But it has felt like it’s run out of steam now and so they should quit while they’re ahead. 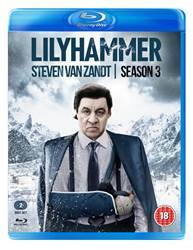 Lilyhammer is a decent fish out of water comedy series and series three is a suitable place to wrap it all up now.